Two crates of Pinot Blanc grapes have arrived at Margerum Wine Company on Industrial Way in Buellton. Owner Doug Margerum and winemaker Jason Barrette are excited about the delivery; the lull between the white and red grape harvests has made it quieter than usual. A group of wine enthusiasts has traveled 40+ miles from Santa Barbara to be winemakers for a day. For the first three Fridays in October, Doug and Jason are inviting guests to hand sort and crush grapes, following the process all the way to blending and bottling their own wine; lunch with the staff is included. 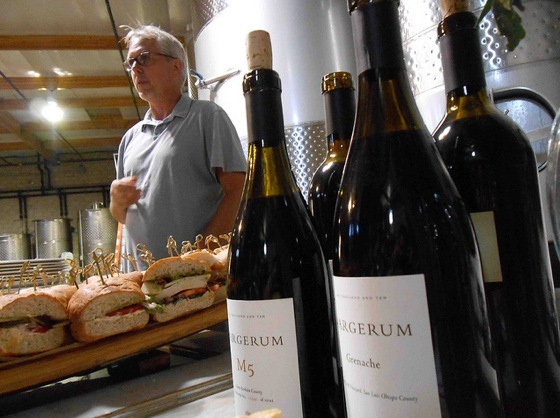 On Oct. 3, Wine Cask, a restaurant Doug co-owns, has arranged for its chef, Brandon Hughes, plus Nik Ramirez of Intermezzo and Bouchon’s Greg Murphy to prepare small bites along with farmstead cheeses, which will be paired with Margerum wines, at Spanish Garden Inn. These are only two of 100 events offered as part of epicure.sb, a month-long celebration of cuisine, libations and culture. Crista Fooks’ Scarlet Begonia throws its napkin in the ring with Friday pop-up dinners. Opening just one year ago, UCSB graduate Fooks (Margerum is also a UCSB grad) debuted her first dinner service on Sept. 27. The pop-ups will be her segue into officially offering evening fare. Judging from her Brioche French Toast and Maple Bacon Biscuit (the eatery offers breakfast all day) and homemade ketchup and mayonnaise, Fooks and executive chef Joel Huff’s dinner menu will deliver more “thoughtful food,” as she likes to call it.